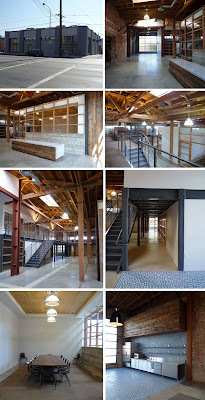 We are nearing completion on this 12,000 square foot renovation for Biscuit Filmworks, a film and commercial production company on Santa Monica Blvd. in Hollywood. The client purchased the building knowing they would have to provide a significant seismic upgrade, but were committed to an expensive proposition as they needed to consolidate their operations into a single building. The client was clear from the beginning of design discussions that he did not want this space to be a trendy “5 year” design. He felt it was important that if someone walked into the space that they could not tell if it was designed today or 50 years ago. He was also clear to state that he did not want it to be “old fashioned.” He is a modernist at heart, and wanted his space to reflect the strong but simple expression that has appealed to him with so much of modern design. Hopefully we have achieved that for him….